If you delete a file in Windows, this file isn't really deleted. Windows instead intentionally "forgets" where the file is located on the hard disk. It is possible to restore some of these files if they have not been overwritten on the hard disk. Our new tool FileWing can help you recovering unintentionally deleted files and can also help deleting files by overwriting them multiple times, so that they cannot be recovered anymore - by anyone! ...... Take a look at our new Windows tool. FileWing checks your internal and external hard disks and also USB-drivesand can identify files that have been deleted. 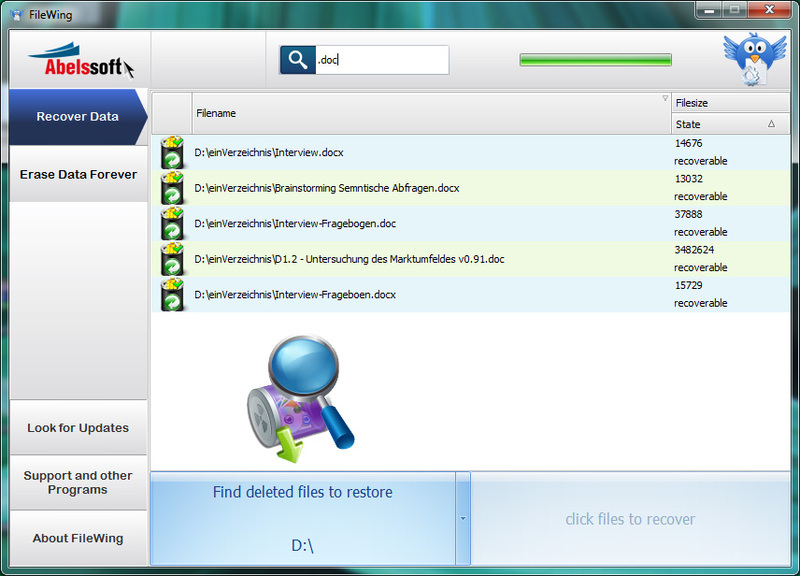 If you mistakenly deleted some files, FileWing can recover these files in most cases. FileWing can recover deleted files. Just name a folder where you want to ressurect you files and FileWing will do the rest. FileWing uses different mehtods to delete data safely. You can choose between 7 different algorithms, which overwrite the files-to-be-deleted with different patterns from 1 to 35 times. The methods we use are based on scientifically proven algorithms - now you can be sure that your deleted files will never show up again! FileWing's interface is easily usable. User-friendly wizards help you in every step of file recovery or deletion. Qweas is providing links to FileWing 2011 as a courtesy, and makes no representations regarding FileWing or any other applications or any information related thereto. Any questions, complaints or claims regarding this application FileWing 2011 must be directed to the appropriate software vendor. You may click the publisher link of FileWing on the top of this page to get more details about the vendor.